I’m a huge fan of those brightly colored Easter Peeps. I hunt the store shelves for Peeps as soon as St. Patrick’s Day is over. 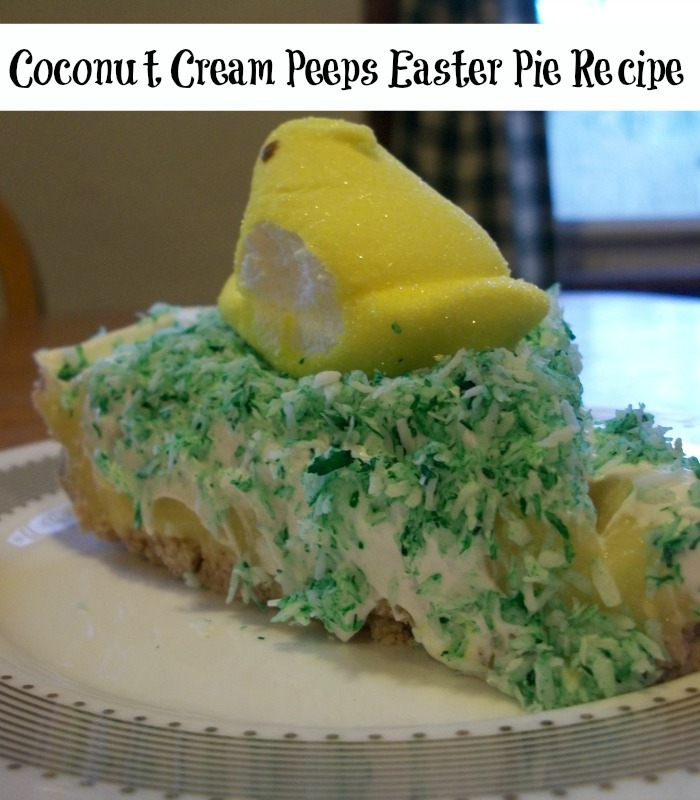 This Easter pie recipe is quick, easy and fun. It tastes delicious and the kids will love the addition of Peeps in the grass on top. If you really want to wow them, toss in some jelly beans too. The nice thing about this Easter pie recipe is that you can make it completely from scratch if you have time or you can use pre-made ingredients if you’re too busy. Make the Jell-O coconut cream pudding pie filling according to the directions. Pour it into the graham cracker pie crust. Let it set in the refrigerator for one hour to become firm. Spread Cool Whip over the top of the pie. Mix a few drops of green food coloring with one cup of shredded coconut. Sprinkle it over the top of the Cool Whip. Carefully place marshmallow Peeps so there will be one on each piece of cut pie. Sprinkle the top of your Easter pie with jelly beans if desired. That is adorable! My son loves Peeps, we’ll have to try this! I think it would be great year round, since they have Peeps for every holiday now. My family loves Peeps. I never thought of using them for cooking.